Pieces of wonderful: Coming up roses..
Has it been a scorcher where you are? The universe was smiling down on me today. I sulked this morning because I had a serious craving for a boot sale..yes I crave them! Can't explain it. But I had booked a hair cut this morning and I had to go, I'm terrible at convincing myself to go because I hate going so having already booked it I really couldn't flake. Well would you believe it, when I walked out of the salon onto Chiswick high street with my OK but not perfect hair cut I spotted a boot sale on the green opposite the high street. Madness. It was completely one off, never been there before but there it was today, waiting for me. I found some treasures too, most of which have been added to my Etsy shop. Some of them stayed with me though of course. Anyway, I am not here today to tell you about my latest finds. 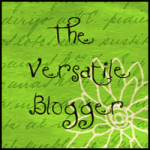 I am here today to finally share something creative that I have been doing. It may have come to your attention that I am somewhat obsessed with rose prints, specifically vintage rose prints. I live and die for them, honestly I do. I have to fight against myself very hard to not cover my entire house in them. So I came up with a little compromise...rose decals. I found a supplier of rose decals/transfers and have filled my world with different patterns and prints. 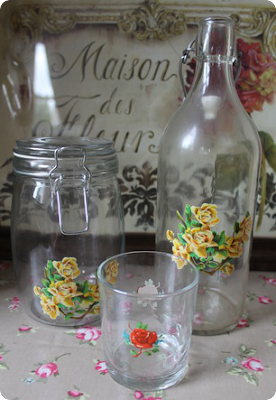 They are just perfect for putting a little extra something onto your plain glassware, furniture, plastic..whatever. I especially enjoy using them to beautify plain jars and glasses. With just a damp sponge and some heat these beautiful vintage style roses will stick to anything. It reminds me of the temporary tattoos we used to wear as children, except much prettier! 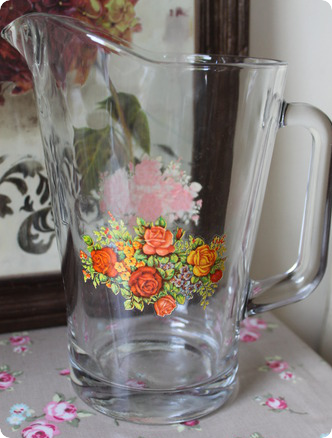 Today I gave this £3 glass jug from a supermarket a bit of personality with a pretty floral bouquet. I saw one similar in an antique centre with six glasses but it was selling for £20. 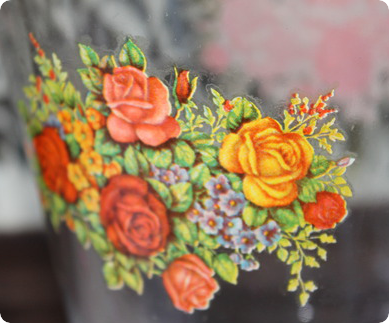 My jug is just a lovely now and much better on the old bank balance..
And here's those beautiful roses up close..
Now I just have to fight the urge to use rose transfers on everything! 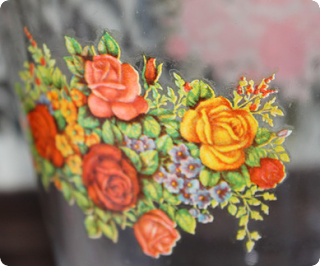 Seriously, if you put anything down in my house, chances are it'll end up looking rosey..
Have you discovered rose decals? How do you use them? Are you as obsessed with vintage rose prints as I am..shall we start a support group? If you haven't paid a visit to my vintage emporium yet, do please stop by. I have filled it the brim with mismatched china and vintage wonderfuls. I've paid a visit to your shop and its full of lovely lovely tempting china...shame you don't ship abroad but then perhaps its not practical with such delicate pieces. I hate going to the hairdressers too such a waste of my time I never seem to get my hair done as I like...I'm too fussy for my own good. You make it look so easy...I've never seen those transfers for sale but I certainly like them on the jar and bottle makes them that bit different. 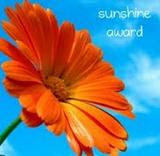 I get mine from ebay from a lovely lady who has lots of different patterns.